Who says making a sales page can’t be easy? Don’t suffer through tedious sales page creation anymore! The answer, I’m sure you’ll agree, is obvious. Anything but dragging your feet through sales page hell! Isn’t your time booked solid as it is? Wouldn’t it be great to free up some time? As a fellow marketer, I know exactly how you feel! Time is of the essence and I use shortcuts as much as possible. Well, here’s some good news that you’re sure to be tickled about. Kim Enders’ Sales Page Rapid fire is a shortcut in itself and it won’t jeopardize the quality of your sales pages. On the contrary, this fantastic software will help you shortcut your way to quickly creating professional-quality sales pages without all the html and formatting headaches. Question: Aren’t most sales page creation programs rather cheesy? Question: I’ve had a lot of problems with software crashing my computer or doing all sorts of other annoying things. What about SP Rapid Fire — it it also plagued by bugs? Continue reading and you’ll see exactly why Sales Page Rapid Fire is such a great investment! User-Friendly Interface – It simply couldn’t get any easier to navigate through our software! No need to be stuck on one step as many software cause you to. All of the steps are outlined and accessible at the tope of all windows! Jump around as you wish — it’s much easier that way. Professional-quality output – This sales page was created with Sales Page Rapid Fire. By using SP Rapid Fire, you too could be making professional sales pages just like this one with minimal effort! Ability To Preview Your Sales Pages – A simple but valuable feature of SP Rapid Fire, you can preview your sales page as many times as you wish while you’re creating it. Gone are the days of having to start all over if you botched up just once! 3 Customizable Sales Page Templates Built In! – 3 Template Options — They’re all you’ll ever need to make great sales pages every time! Save Option – You can save any sales page you work on (at any point) by clicking just one button! Ability to easily include your graphics – No need to hard-code graphics into your salespage. Just browse and find your picture file. Click one button and SP Rapid Fire will automatically insert it for you! Automatic Testimonial Building! – Just copy and paste a testimonial into the testimonials box. Click ‘Save’ and SP Rapid Fire automatically inserts the testimonial for you. No more wasting time creating tables and formatting them! Easy Feature-Add Option – Instead of one window where you type in all of your benefits, SP Rapid Fire lets you list and name options one at a time. SP Rapid Fire then takes the features and formats the text and list automatically! Easy Ezine Sign-Up Web Form Integration – With SP Rapid Fire, it’s as easy as copying and pasting the web form html code into one the software’s designated window and going on to the next step! No Need To Manually Insert Your Paypal Button Code! – Just copy and paste your Paypal button (html) code into the window we have set up for it and go on to the next step! It’s really as easy as that! Extended Font and Color Capabilities – Unlike other software out there, while you’re creating your sales page within SP Rapid Fire, you can easily modify your fonts and color. A BIG PLUS! Makes Pumping Out Sales Page After Sales Page Easy! – Most people burn out after creating one sales page manually. With SP Rapid Fire, you won’t burn out so quickly since the software handles just about everything! No Smarttags Or Bulky HTML! – SP Rapid Fire does not add ten tons of gunk to your html code. For this reason, your sales page size will be smaller and your page will load up quicker than if you used certain popular html editors. User Guide Included! – Although we consider SP Rapid Fire to be extremely easy to use, we’ve put together a user guide to help you along and to explain what’s what. This, of course, comes with the software. Say goodbye to time wasted and hello to great-looking salespages and more time to spend doing more important things, like spending time with family!After payment, you’ll receive the Sales Page Rapid Fire application, its User Guide and the satisfaction of knowing that you’re about to save yourself from a lot of wasted time and frustration! I personally guarantee that you’ll love Sales Page Rapid Fire or your money back! Give it 30 days and enjoy the heck out of it. If, within 30 days, you don’t find it to be everything that I’ve said it is (highly unlikely), let me know and I’ll send your money back. I wanted to keep SP Rapid Fire affordable for you. I’m sure that you’ll agree whole-heartedly with previous buyers once you’ve tried it out for yourself. Now that I think of it, maybe I should go ahead and raise the price… Hurry before I do! Look at it this way — $67 is really a painless drop in the bucket to be able to get your hands on Sales Page Rapid Fire and start using it right away to improve your lifestyle! It’s easy to get started right away. Just click the order link below. 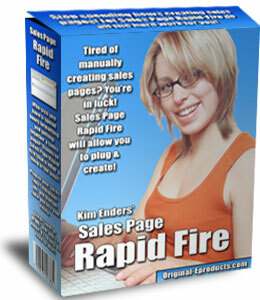 Don’t you owe it to yourself to try Sales Page Rapid Fire today?